Craney Island Lighthouse was built at the former entrance to the Elizabeth River at Hampton Roads, Virginia in 1859. It was a square screwpile light. Confederates damaged this lighthouse in 1861. This lighthouse was replaced in 1884 by a hexagonal screwpile lighthouse after much decay and damage. 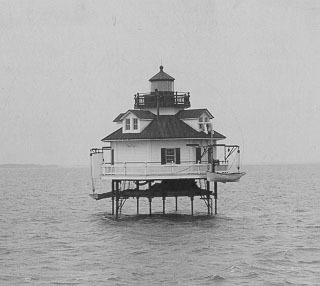 The 1884 lighthouse was assembled at the Lazaretto Depot in Maryland. In 1891 a new main gallery post was put up to replace one broken by a passing vessel. The light survived until 1936 when it was deactivated and replaced with a light on the original screwpile foundation. Prior to the construction of the 1859 lighthouse, the first permanent lightship station in the U.S. was anchored here in 1820. It was originally at Willoughby Spit but weather and sea conditions proved too harsh.